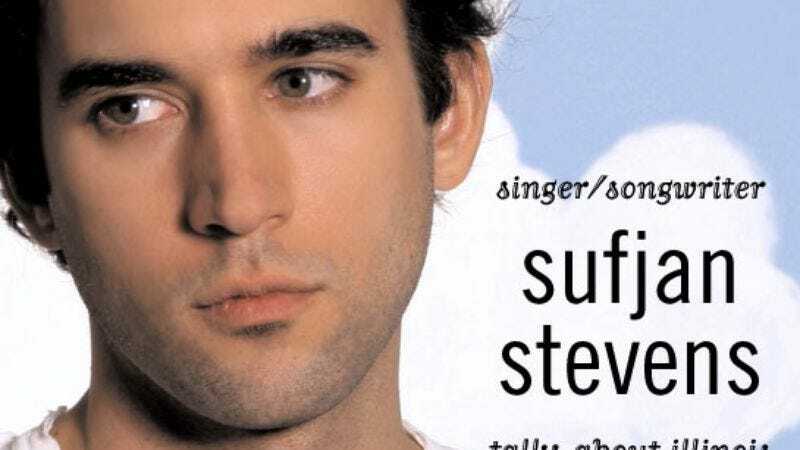 Sufjan Stevens was an intriguing but minor figure in folk-rock's experimental movement until 2003, when he released his third solo album, Greetings From Michigan: The Great Lake State, a sprawling tribute to the place where he grew up. The record alternated singer-songwriter confessionals with social commentary, all scored with elaborate, Steve Reich-like orchestral patterns and Stevens' airy, melodious voice. It was charming, emotional, and a significant creative leap from Stevens' earlier work. He followed Greetings with last year's Seven Swans, a collection of gentle, spiritual songs that directly addressed his Christian faith. Then he returned to the Midwest for his latest album, Illinois (or, as the cover art says, Come On Feel The Illinoise). Before its release, Stevens announced plans to record an album for every state in the union. It's an ambitious goal–just ask The Dambuilders, who couldn't finish writing a song for every state–and it's brought the 30-year-old the kind of "Who does he think he is?" publicity previously reserved for Dogme 95 adherents and the Elephant 6 label. Recently, Stevens spoke with The A.V. Club about his sly self-hype, his Protestant work ethic, and the hidden meanings nested within an album about small towns, big cities, Superman, and John Wayne Gacy. The Onion: What sort of research do you do for these state records? Sufjan Stevens: With Michigan, it was really all memory and recollection. The whole record was rendered by my imagination and my perspective on events and circumstances I knew growing up. With Illinois, it's completely the opposite. I did a lot more reading and research, and pretty much the whole thing was based on a survey of data from libraries and books. Picture books, Saul Bellow, Carl Sandburg, biographies of Lincoln—a lot of research. And then I wrote letters to friends from Illinois and solicited their takes on different towns and cities, from growing up there. So it's really kind of an assessment of second-hand information, you know? I wanted to create an emotional distance that wasn't available with the Michigan record, and I wanted an undertaking that was based on research materials and history, because I'm interested in how history prescribes meaning and how language and labels and the summaries we do in history books determine our understanding of past events. That's kind of where I was going. O: Some of the topics you landed on make perfect sense, but why, out of all the people from Illinois, did you choose to write a song about John Wayne Gacy? SS: I kind of wanted an anti-hero, because I had been working on material for Superman and Metropolis, and developing themes that were really big for the World's Fair and the Sears Tower, and using Saul Bellow and Carl Sandburg and Abraham Lincoln. And I felt like all the information I had gleaned was really optimistic, about the resilience of the Midwestern worker and the industry and commerce that went into developing Chicago as a major American city. So I guess I wanted to develop a story for a character that went against all of these other themes. O: Were there any ideas for Illinois that you kicked around and then kicked out? Anything you researched that you just couldn't make work? SS: Yeah, a lot. Saul Bellow was one. I read The Adventures Of Augie March and I was planning to use him as a muse, but I felt like his artistry and vision were so complete and so profound, and his style so kind of cumbersome and glib and very self-conscious—far more sophisticated than Carl Sandburg. I felt like I couldn't really use Bellow as a resource for a song, where Carl Sandburg's work is more classical, more romantic, and it seemed to work more with music and lyric writing. And I tried to write several songs about Abraham Lincoln, but there's been so much written that I ended up just cutting several of the songs on him. I wrote a song about the supercomputer in Champaign at the University Of Illinois. I wrote a song about Springfield, and Pittsfield, and the Mississippi River. And a lot of this stuff either just was too cumbersome, or it didn't work stylistically with the rest of the songs. I realized very early on that I needed to have a very clear, concise, overarching vision, and that everything needed to be monitored by the standards of that vision. O: So what happens to those songs? Can you reuse the Mississippi song when you get around to doing Missouri? SS: No, I'll just leave them on my computer. [Laughs.] And man, the supercomputer song is one of my favorite songs I ever wrote. It's so weird. It's really stiff. It uses all acoustic instruments, but it sounds really robotic. Everything we did was really very stiff, you know, really very metered. And it's in 7/8 time, so it's really awkward, like it's missing a beat. It's really fast. But a lot of the songs I cut were just exercises, and ideas I'll definitely use later on. O: These songs were fully written and recorded? SS: Yeah, that's kind of how I write now. I write through recording. I have a portable 8-track. An old, outdated Roland—the 880 EX. And then I use Pro Tools to edit. So I record a lot of it at home. And for this record, I also used a studio in Queens. O: The instrumental fragments that run through Illinois have Illinois-specific titles, but were you actually thinking about the workers of the Rockford River Valley region when you recorded the song addressed to them? SS: Yeah! [Laughs.] I was meditating on unemployment and, uh… the working hands of Americans. Probably not. I think overall I was thinking about a lot of things that were particular to Illinois. But usually, the music is independent to a concept or an idea, and then it begins to evoke particular meanings, based on the expression and character of the melody. And for that piece, it was feeling kind of maudlin and melodramatic, but it also felt very whimsical and fluid, like a river, like the Rock River. So I just felt like it was the perfect centerpiece for the theme of Rockford, and the working-class there. O: So to an extent, you were thinking about those workers. SS: I think so. When you have an idea from the beginning, it's just an idea. It's just a musical sound, you know? Just a collection of notes, a series of melodies. And I don't think it has any meaning, or at least not any symbolic meaning that we can apply language and symbols to. Or maybe it has meaning and we just don't recognize it. Maybe I'm just realizing at this moment that I recognize the content and the subject, but it wasn't revealed to me at the very beginning. O: Some of the songs on the record seem like exercises, like "Decatur," which almost sounds like your attempt to find a bunch of words that rhyme with Decatur. SS: Oh yeah. It's really an exercise in rhyme schemes. It's just fun and games. But I think a person from Decatur will acknowledge that all of these references are based on real events and circumstances that have happened in and around Decatur, throughout history. So "alligator" rhymes with "Decatur," but there also was an alligator sighting in one of the rivers in Decatur. And "caterpillar" refers to the manufacturers of Caterpillar construction equipment. And, you know, they've had sightings of kangaroos there. There was a flood, and it did exhume a graveyard where Confederate and Union soldiers were intermixed. So a lot of the rhymes sound silly, but they're actually based on fact. O: It's fun, and historically accurate. SS: And at the heart of it, it's really a song of reconciliation between me and my stepmother. [Laughs.] I think every song has, like, three levels, you know. O: It does seem that the record has a thread that's not necessarily specific to Illinois. It begins with UFOs, and ends with a different kind of spiritual transcendence. SS: It's all based in settings in Illinois, and uses Illinois as a context, but really, the record is much broader. It's more about universal things. It's about my imagination, it's about my understanding of industrialism in the Midwest, it's about the Midwest in general, it's about human beings, you know… It's about much bigger things. Illinois is just kind of a veneer over the fabric of the record. That's why the cover art is so silly. It's sort of meant immediately to disarm you, and let you know that it's just this big silly advertisement. At first glance, it's really just a pun. O: There have been some complaints in online forums about the art, and about the "Illinoise" pun. SS: I was kind of expecting to offend a few people. Growing up on the border there, we were always frustrated with people's pronunciations of towns in Michigan, and people mispronouncing Illinois. There are all these Native American words that no one really knows how to pronounce. O: Going back to the Michigan record, obviously it's very specific to places you knew growing up, but how much did you think about Michigan while you were actually living there? SS: Probably not very much. I mean, you think about it in very practical terms, because you're living within the geographical boundary. But a lot of time was spent planning my escape, you know? Preparing for a life beyond the Midwest. And I think that's what a lot of the Michigan record is about, this kind of internal and emotional tension between living and being in a place and then leaving it and looking back and having a different kind of experience with the memories of that place. O: Do you think you can carry that kind of personal feeling with you the farther you get from Michigan in this whole states project? Illinois is still fairly close, but what happens when you get out west? SS: Well, I have some specific experiences in Chicago and Peoria and sort of southern central Illinois, and I've used those experiences in some of the songs, but I think the more I work on these states records, the less emotional investment I'll have in the material, at least in terms of my memory and my experience. But I'm kind of interested in experimenting with other methods and concepts. You know, using geography exclusively, or using vegetation, or birds or animals. I'd like to do a record that doesn't even reference actual places. Because I think it's kind of an open-ended concept. It doesn't have to be taken so literally. O: This plan to record an album for each of the 50 U.S. states—in a way, it obligates you, and in a way, it frees you to be creative as you just described. But it also gets you some attention, don't you think? Whenever an artist steps up and announces a bold plan, it gets the media talking. SS: It is really audacious, and I'll admit that it's all advertising, and all gimmick. Initially, it was intended just to get attention. In some ways now, I'm probably second-guessing all that. [Laughs.] But it's made me exert myself in a way, to enable people to come to terms with the music on its own and the value of the music, and not the value of the proposition. O: Have you been surprised by how much attention has been paid to the fact that you're a Christian? SS: Um… Yeah, I think it's a little disconcerting. It can be a little frustrating. I think that certain terms that we use to describe a culture or religion are in some ways our way of isolating people, and I think sometimes these terms bring up all sorts of prejudices and misunderstandings and misconceptions. And I feel a little frustrated and guilty about being a part of that banter. And in some ways, I feel like this is something that is really important and sacred. Maybe it really shouldn't be a part of public discussion, because, you know, it really is about personal relationships. O: Also, you're Episcopalian, and growing up Episcopalian is not really the same thing as growing up, say, Southern Baptist. SS: I wasn't actually raised Episcopalian. I go to a kind of Anglo-Catholic church now that I've been going to for the last three years, but I haven't really been raised that way. I'm definitely entrenched in the tradition now. I kind of admire it for being so traditional and sort of unchanging and unwavering in a lot of its doctrine, but also very sort of open and broad in its understanding of human nature. I like that it's kind of open to the discussion about the tensions between those two things. O: No Episcopal youth camps in your past? SS: I missed all that. I've read in a couple stories that I was raised Episcopalian, but that's not true. I think that's just people assuming things. In some ways, I wish I was raised Episcopalian. I was kind of raised hodgepodge. O: Your first name certainly doesn't sound Christian. SS: It's a Muslim name. I was sort of born into a Subud cult that has ties to Islam and Indonesia and Middle Eastern spiritualism. My parents were kind of trial-and-error when it came to religion. O: On the Seven Swans tour, your band wore swan outfits. What's up for the Illinois tour? SS: We're going to wear cheerleading outfits that are based on the University Of Illinois Fighting Illini cheerleaders. [Laughs.] Me and my brother made 'em. We're going to have pom-poms and do cheers and hand-claps.